The Death of Magnus Erlendsson. Pen & ink, 2018. This cartoon depicts Magnus Erlendsson about to be killed by his cousin Haakon Paulsson’s cook on the cleg-infested island of Egilsay. It was created to accompany The Orkney News column in the August 2018 edition of iScot magazine. Magnus and Haakon were joint Earls of Orkney in the early 12th Century AD, but fell out. They agreed to meet on Egilsay to discuss terms, but Haakon betrayed Magnus and turned up with far more ships and men than he had promised. It is said that Magnus was a kind, peaceful man, who had refused to fight on a VIking raid to Anglesey. No-one was prepared to execute him, so Haakon made his cook do the deed with an axe. 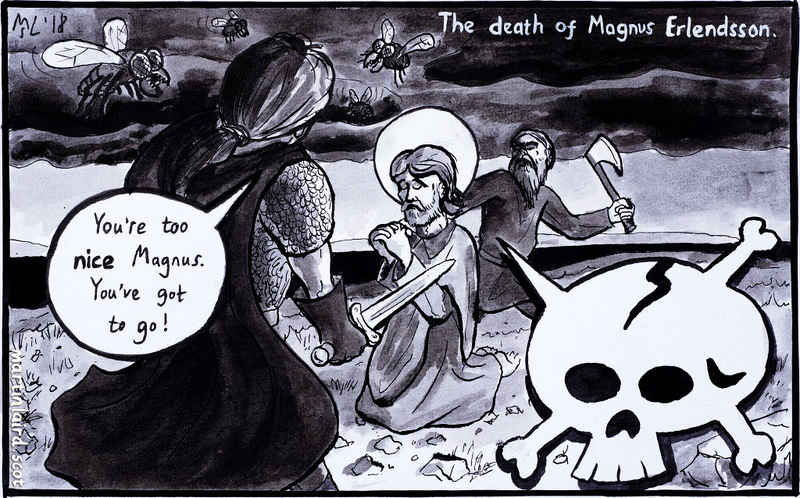 Magnus was killed around 1116AD, and canonised to become Saint Magnus in 1136AD. His skeleton, with skull showing the axe-wound, are now interred in a column in St. Magnus Cathedral in Kirkwall.